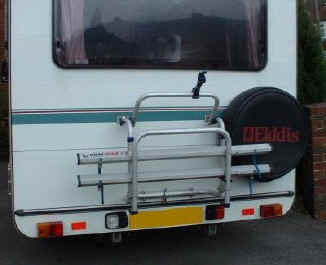 This is the bike-rack we fitted to our previous Elddis Eclipse coachbuilt motorhome. I fitted it low down on the rear bodywork so that the rear window can be opened slightly with the bikes in place. It is necessary to rotate the handlebars of the inner bike a small amount to clear the rear window. I leave the handlebar clampbolt slack (as a possible anti-theft device if someone was to remove the bike and attempt to ride off!). We also lock the bikes to the rack with a D-lock and a separate long cable lock threaded through the frames, wheels and saddles. I moved the outer bike rail inwards as there are another set of mounting holes and it can take three bikes but they would be very close together. It was quite an exercise to arrange the bikes on the rack. The top support rail is adjustable and I purchased an intermediate length clamp for the outer bike instead of the long one they supplied. 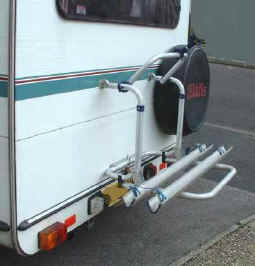 I chose this rack rather than the Fiamma one because it had to clear the spare wheel mounted on the rear when folded. The top two brackets are tophat shaped and the rack is hooked onto these with a swinging action so it locks firmly. The supplied 5mm bolts have been replaced with plated 6mm high-tensile socket head capscrews. The makers claim the tubing and fittings are made from aircraft grade aluminium alloy. The internal mounting plates supplied are the same size as those visible on the outside. I used aluminium spacer tubes for the bolts to prevent the bodywork from crushing. These tubes must be precisely the right length. Inside the motorhome, which has a rear lounge, I fitted a panel of 10mm exterior plywood about 45cm high across the complete width of the body. This is covered by the existing fabric trim panel. 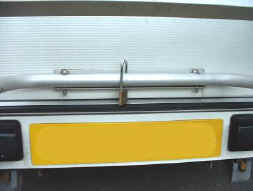 This panel stiffens the rear of the bodywork and spreads the load over a larger area. lower mounting bracket This is the lower mounting for our bike-rack which is rated at 50Kg but I would not like to put more than two adult bikes on it (ours weigh about 35Kg total). In the picture the 6mm bolts with nyloc nuts haven't been tightened, showing a small gap which tensions the rack mountings when fully fitted. I've drilled an extra hole for the padlock. The L shaped bottom support has two bolts passing through the bodywork. 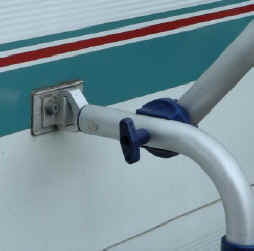 I used normal non-setting caravan sealant spread over the support plates when assembling. The supplied plastic covers for the top mounts when the rack is not fitted don't clip on very firmly and are now lost somewhere!